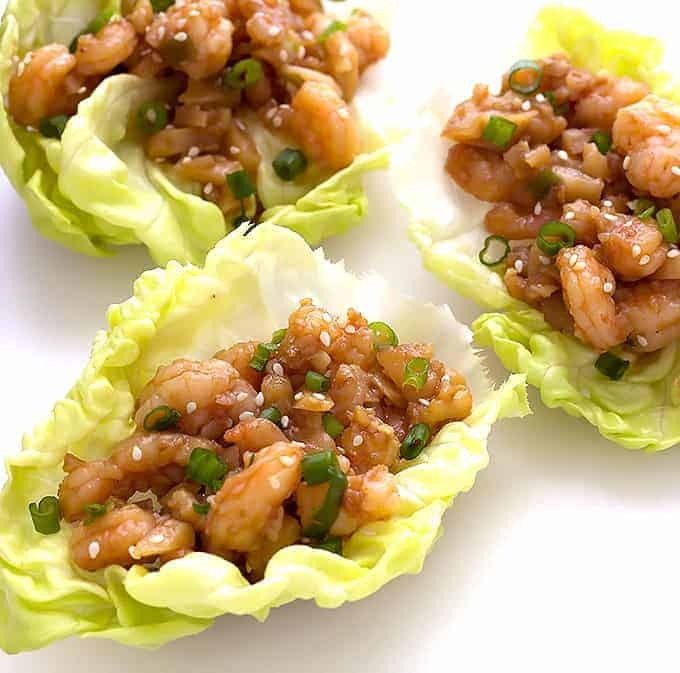 Hoisin Shrimp Lettuce Wraps are full of shrimp and a sweet and tangy Asian inspired sauce. They’re light and tasty with great crunchy texture. 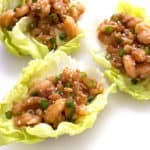 These Hoisin Shrimp Lettuce Wraps are so quick and easy to make. Shrimp is always a quick cooking ingredient. But, in this case the shrimp is chopped. So it literally takes just a couple of minutes to cook up. The chopped shrimp are mixed with chopped water chestnuts and sliced green onions and coated in a sweet and tangy Asian inspired sauce. Then, this flavorful shrimp gets spooned into lettuce leaves for serving. In a small bowl, add the hoisin sauce, soy sauce, vinegar, honey, and garlic. Whisk until well combined. Drain and coarsely chop the water chestnuts. Slice the green onion. Add the water chestnuts and onion to the sauce. Stir to combine. Set aside. Coarsely chop the shrimp into 1/2 to 3/4 inch chunks. Heat the oil in a 12-inch nonstick skillet over medium-high heat for 2 minutes. Add the shrimp in an even layer. Cook 2 minutes, stirring often. Add the sauce to the skillet. Stir well. Cook for 3 minutes, stirring often. Remove the skillet from the heat. Let the shrimp rest in the sauce for 2 minutes. Serve by spooning 2-3 tablespoons of the shrimp mixture into the center of a lettuce leaf. Optional: Sprinkle with sesame seeds and green onion. This recipe could be served as an appetizer or an entree. As an entree, this will serve 2-3 people. I’m a Registered Dietitian trained in food science and recipe development. It’s my mission to bring you the BEST recipes your whole family will love. See more. How much shrimp per person? or how many adults will the 1 lb make? The shrimp is chopped so hard to assess how many per person but my husband and I each had a hearty serving and I had another serving left for lunch. This recipe is excellent! I added chopped peanuts for garnish and topped with sweet chili sauce. I also have made this and put over basmati rice. I’m a Registered Dietitian Nutritionist living in the St. Louis, MO area. I’m an avid cook, travel nerd, & lover of good food! I’m trained in Food Science & recipe development. It’s my mission to bring you the BEST recipes your whole family will love! See More.